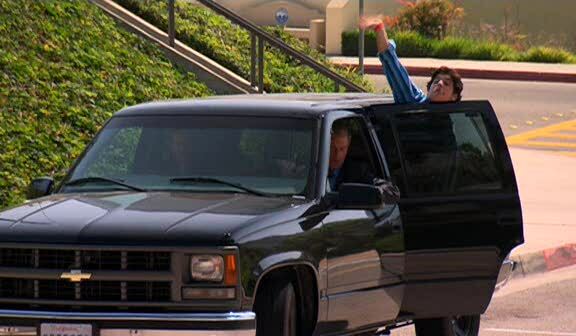 IMCDb.org: 1997 Chevrolet Tahoe PPV [GMT420] in "Drake and Josh Go Hollywood, 2006"
Are any other shots available? This looks to be a 1997-1999 Chevrolet Tahoe PPV. I don't think that's a Suburban, it's too small. Giving it a closer look, I definitely think it's a PPV. It's definitely a Tahoe and it has the lower 2WD suspension that the PPV's have. It also has the grill/headlights, but the bigger clue is the rear tire that is barely visible. It has the black rim with chrome center cap that the PPV's have. Any other opinions are welcome. @ Terra. Any way to get a more clear image of the pillar trim level? I'm curious to know the trim of these W/T Tahoes. I do not know much about these. Were these models ever sold to the public (civilians) or were these fronts fleet/commercial only? Edit: The thumbs do confirm this is a Tahoe by the length of the rear door. funny, it has a blue light when pulling up the Viper but its gone when Josh gets in..
dhill_cb7 wrote @ Terra. Any way to get a more clear image of the pillar trim level? I'm curious to know the trim of these W/T Tahoes. I do not know much about these. Sorry but those are the only images I could get from it. The vcharacters kept blocking it.